Those of you who’ve followed this site and the podcast for a while will know that it took some time for me to first write, then publish my first novel, A is for Angelica. Like every other author, I had to deal with life getting in the way and make a number of sacrifices. Nothing unusual about that. Perhaps the most frustrating period was the time between getting an agent and actually selling the book to a publisher. It seemed to take forever and there were plenty of knock backs. Again, nothing unusual. At the same time, I saw more and more people self-publish their work successfully, and with Write for Your Life (the name for this site previously) doing well, it was always a real option for me. If other writers with a similar-sized platform could make a go of it, then why shouldn’t I? Of course, the problem was, I never wanted to self-publish my novel. However tempting it might’ve been to just get the work out there, that was never my dream. I’ve half-joked before about wanting to make the Booker shortlist, appear on BBC Radio 4’s Front Row, or to have my fiction reviewed in the Guardian. I said that this was only possible through traditional publishing, that even then it would be unlikely, but it might just happen, it would at least, as I say, be possible. Of course, what I really meant was that mainstream media is important to me. I think that’s why a lot of writers would still prefer to find a publisher than try it out for themselves. It’s the seeing your book in the local shop appeal. It still holds sway. It still means something. 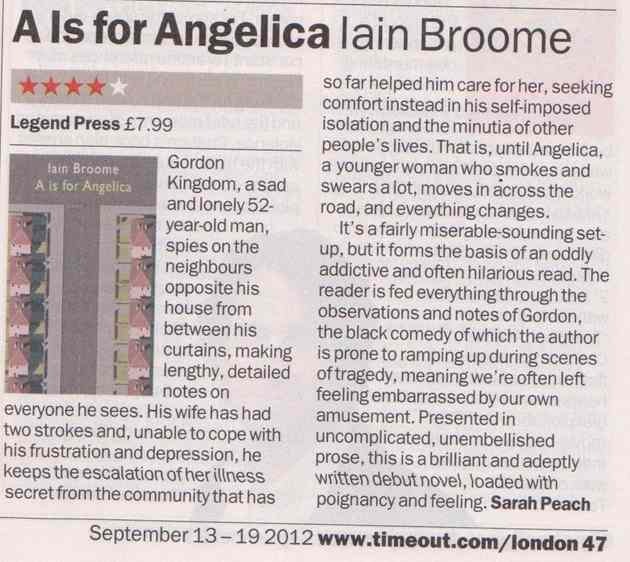 In the last week, I’ve appeared on BBC Radio Sheffield and A is for Angelica has been (favourably) reviewed in Time Out magazine. This represents my first real taste of mainstream media as a published author. It’s been surreal, but I’ve loved every second. Self-publishing is a legitimate and profitable choice for lots of people. But if your dream is anything like mine was, you need to know that it can come true. Writers get publishing deals every day and if you have the talent and a little good fortune, there’s no reason why you can’t be one of them. It might take years and it might not happen in the way that you expect, but speaking from experience, which finally I can, it’s absolutely worth the wait. What do you think? Are you a published author and was the wait worth it or are you in the thick of it and ready to give up the ghost? Tell me your thoughts in the comments. I know quite a lot of people who have self published and several of them have made a decent amount of money out of it. Personally, I want to go down the traditional publishing route for the verification that my book is of a certain standard. Of course it would be wonderful to earn pots of money but that’s never been the real drive. I’m not even bothered about awards, I just want to be able to share my stories and say I’m a (traditionally) published novelist. I was right! Traditional publishing and the ‘That’s my book on that there shelf,’ excitement still holds sway. I personally think that hybrid publishing is probably the way forward. I talked about this on a recent podcast with Joanna Penn. Worth a listen. I completely understand your reasoning for waiting, and it’s largely why I’ve held off of self-publishing, myself. More than that, however, is the community that comes with traditional publishing–the agent (assuming you get one), the editors, etc. are all there to help you, whereas in self-publishing much of that work ends up on your shoulders (until you start hiring people). Thanks for the kind words Ava and no problem! All I ever ask is that writers, before they go one way or the other, have a good think about what they really want. And then to look at whether it’s achievable or realistic. From then on it’s one step at a time and a lot of hard work. And waiting, yes. But if you self-publish properly, using an editor, proofreader and the like, you’ll have to wait a little then too. There is no (and should be no) quick win when it comes to publishing. You have to earn your stripes. I’m in the same boat. I did self-publish a book of ghost stories, but only because they were regional, and I’d approached every regional publisher I could find. One even wrote me a kind letter about it, admitting that I’d probably have to go that route b/c there were so few publishers in rural Kansas in the U.S.
I’ve had several novelists urge me to at least publish my novels electronically, but I have never been keen on the idea. I’m still not, mainly because I’m not sure I have a single novel that’s ready to be published. I’ll wait. I’ll be patient. And I’ll feel okay until it happens. I’ll just keep writing, and see where it all takes me. I’m so happy for you, though. And good luck with the twins! Whew! That makes me tired just thinking about it! That’s interesting that you say you’re happy to keep writing and perhaps wait until you’ve got something you feel is more ready for publication. I’m very thankful that I didn’t heavily pursue a publishing deal for my early short stories. They were good to get me going, but nothing like as accomplished as what would become A is for Angelica. There’s a lot to be said for self-awareness and knowing what’s ready and what’s not. Good luck!